(Via Garbut) 17th June 2012. Matheran, literally meaning “Forest at the top” is one of the most frequented peaks of the Sahyadris. It is one of India’s loveliest and well-preserved hill stations with entry of vehicles restricted inside. For us Mumbaikars, it’s a quick weekend getaway and a gateway to heaven esp. during monsoon. Apart from its various sightseeing points that offer scenic views, it boasts of a heritage narrow gauge toy train! It is a favourite with everyone and visited by all - right from families including kids & old people, to couples, youngster groups, drunkards, and the general employed public. In spite of the crowd, it has a heart large enough to offer several adventurous trekking routes for those nature-lovers who have a hunger for exploration. Apart from trekking, many clubs also conduct thrilling adventures like valley crossing, rappelling etc. In any season, it’s a boon for birders and nature lovers. One never gets bored of the peaceful walks among its woods. If that’s not enough, you can enjoy a horse ride too. As a kid, I first visited Matheran when I was in the 6th or 7th standard. 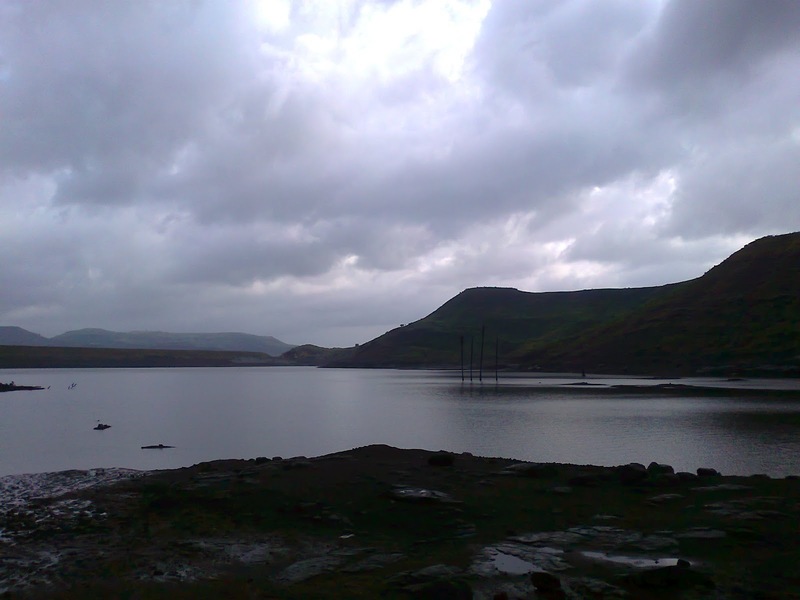 I had gone for a winter trek arranged by K.V.O Mulund along with my best childhood friend. I remember we took a local from Mulund on a Saturday night. We were supposed to spend the night on the platform at Neral Railway station. But instead of sleeping, all the kids in the group had fun playing throughout the night. Next morning, early at 5 or 6am, we set out for the trek. Don’t recollect more about it nor do I remember which part of Matheran we visited then. It was still a nice adventure. I happened to visit this place once again in July 2005 (my first trek, with PHC), when we did a traverse from Peb fort. We did not enter Matheran; rather we walked on the rail tracks to descend towards Neral. Later in June 2009, once again with PHC I happened to trek Matheran via Dudhane village. Yet again it was just touch and go. It was only in June 2011, that I actually entered the hill station. I had planned a 2-day trip with my close friends. We walked the tar road from Neral railway station to Dasturi naka. We covered only some of the points riding on the horses. It was fun in the rains. Actually Matheran has started to become an integral part of my hiking calendar. I look forward to kick off the monsoon season with a trip or a hike to Matheran. It’s the first place to head for at the onset of rains. I wish to explore all the trek routes and cover all the points of this beautiful hill station. I was amused to hear that there is a small Jain temple atop Matheran, so next time I’d be looking to visit it. I’m also longing for my first ride in the toy train. My only wish is that they should allow cyclists at the top! 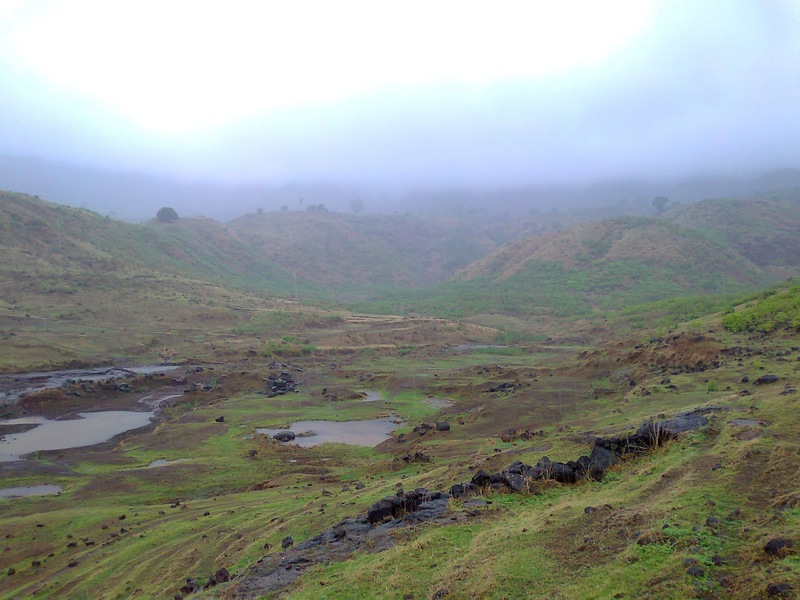 Come June 2012 and the monsoon season nearing, I had decided to trek Matheran – this time via the Garbut plateau. Just a week before the trek I started finding out about the route. I sought the guidance of Phadke Sir and also scanned through useful info from some trekking blogs on the Internet. That helped me visualize and plan the trek. I gathered info about landmarks and village names lying on the route. I was pretty excited about this trek. I had all the information and now it was a challenge to execute the plan in reality! As usual I received pretty lukewarm response to the invitation. I used to get saddened by the declines and back-outs earlier, but I’ve realized that you actually enjoy a lot more when you have a small group of like-minded trekkers. That way you tend to have greater flexibility and can do a recce of new routes, which is otherwise not possible for a larger group size. No doubt we can enjoy in a large group as well, as we many times do in college hikes. College hikes are super fun! But the thrill and pleasure of trekking alone (which has eluded me so far) or say when you are leading a group to a new place is also worth experiencing. Thankfully, I managed to get company of a few friends and the Trek was on! Monday no rain, Tuesday no rain, Wednesday no rain…There was hardly any rain for the entire week. The IMD had predicted the rains to gain strength from June 17th onwards. Luckily the rains picked up momentum from Saturday evening itself. We were a group of Fantastic Four – Bhavik Shah (ex-PWC), Bhavik Shah (ex-KPMG), Tejang Shinde (Dentist, who joined us all the way from Borivili) and myself. I was curious as to how the trek would turn out to be and had kept my fingers crossed. Early morning, on 2012 June 17th, all geared up and excited, I left for the railway station to catch the 5:54am Karjat slow local, Only to find that the ‘Smart’ Card machines (smart, huh?) weren’t working and the long queue at the booking counter gave me some anxious moments. To add to this, Tejang called up saying that the Western Railway trains were very late (due to some mishap near Andheri) and his train was stuck somewhere near Goregaon. I suggested it was all right if he couldn’t make it. But he took a chance – one that worked perfectly. He took an auto all the way to Ghatkopar! It was around 5:20am. I confirmed with both the Bhaviks and was assured that at least they were coming. The train time was nearing and I still hadn’t got my tickets. Luckily I managed to get them with 5 odd minutes left. Just then Tejang joined me and the train arrived, we were Spot on! Bhavik PWC had already boarded the train from Dadar and Bhavik KPMG joined us at Mulund. The time in the train was spent discussing about treks, places, CA firms, and old memories. We touched Bhivpuri Road at 7:30am. There was a light drizzle. We headed for Diksal village, situated right next to the station (Western Side). After a small walk through the village we came out at the Karjat-Neral road. There were a couple of food shops at this ‘junction’. I confirmed the route towards the dam with a paanwala and we moved ahead. All people we met on our way suggested we head for Matheran via Neral. But hey come on, we are enthusiastic trekkers - How would we make them understand that we have come here on a mission. We have taken this route on purpose because we love the thrills and challenges that new routes and places offer! So we just smiled and proceeded further. The road now turned to the left and we arrived at a temple. From here on the road turned muddy and sloped up gently to take us to a small hillock. The dam lay just beyond this hillock. I was wary of the buffaloes that come in our way, especially after last year’s “buffalo-run” while trekking Peb. One can notice a thin black rubber pipeline going towards the dam. The dam is a serene spot. One can plan an ideal one-day picnic here. It’d be great if someone can arrange for a small boat though. You’ll first come across the backwaters of the dam. The dam is actually built on the other side of the reservoir so you don’t have to walk on the ‘The Dam’ structure as such. The route lay along the banks of the reservoir. You have to walk to your left hand side in the direction of the mountains. Further ahead, we reached a flat open marshy area. The marshy area was actually the delta formed by the stream that originates from the mountains and mergers with the reservoir. Since it was just the beginning of the rainy season, the stream hardly had any water. In the monsoon this stream swells into a mighty flow of water often requiring use of ropes to cross it. A faint drizzle accompanied the cool air. 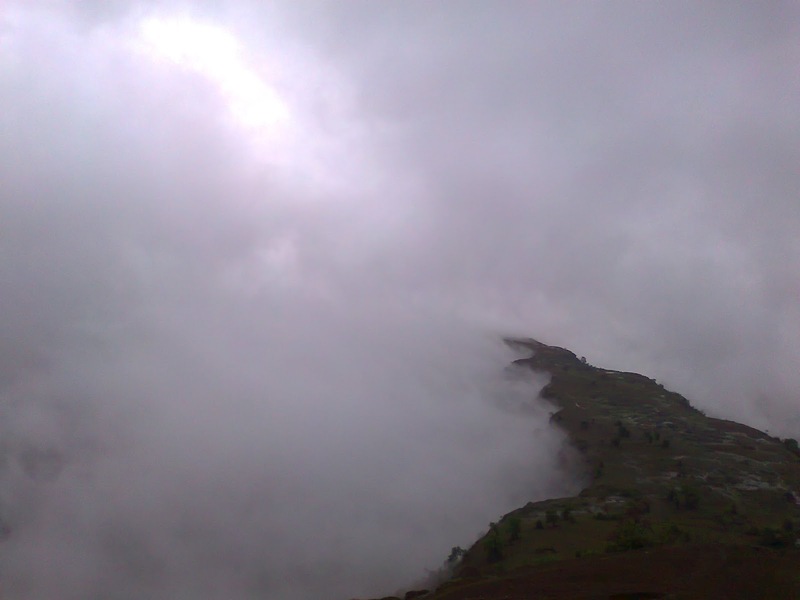 The main mountain range was half-covered in monsoon clouds. So we were assured of the rains at the top! Facing us was a wide valley with hills sloping onto it from either side. The region was coloured in different hues of green. There were cattle grazing and a few humans around. Towards the leftmost point was a giant waterfall, a diversion that Phadke sir had mentioned to me. One can make a visit to this beautiful waterfall when on a picnic at the dam. Our next target was to reach “Bhutavliwadi”, a hamlet located on the small connecting hill range leading to Garbut plateau. We confirmed the route with a “Maushi-ji” and climbed up the steep slopes of the hill range to our right. The route, which lay on the ridge of these hills, now elevated gently. The view of the entire valley was worth capturing. On the way, the monsoon showers embraced us. Continuing with my spectacles on seemed of no use now. I chose to enjoy the greenery with my naked eyes. None of us cared to put on the windcheater. Instead we just enjoyed being drenched by the cold rainwater. We were walking since morning and had gained a substantial altitude from where we got an amazing view of the route we had taken. The dam appeared small from such a height. We could spot both the hamlets along with the well in between them. The temporary absence of rain allowed us to grab a bite of “Elaichi kela” and some biscuits. We took some “group” photos too. Just then two middle-aged experienced trekkers passed by. We had a small chat with them. They were from VentureWorld, a Mumbai based club that organizes Trekking outings esp. for School children and corporate people. They were here for some warm-up and recce for the ensuing trekking season. Their appearance and style matched with two of our senior Podarites – Amar Khamkar and Vikas Kavle! At about 12pm, we made it to the Garbut Plateau. As I mentioned earlier, nothing was visible apart from the land that we stood upon! There were clouds on either side of the plateau. These clouds were akin to cotton flying in the air. A faint silhouette of the Garbut point with its railing could be seen through the fog. I felt a sense of accomplishment. We were successful. The 2 VentureWorld trekkers were to return down the same way as they had arrived on a bike till the base village. After a brief chat, we bid them adieu. After the thrilling walk on Garbut plateau, we reached the base for our climb. From here, a muddy path to the right takes you to a dead end whereas the one going towards your left takes you to a small village. You simply have to climb straight up in the direction of railing of Garbut point. The climb was exposed and steep, but easy and great fun. By now the force of the monsoon rain had subsided. There was some clarity in the surrounding views. Far off, we could see the dam on one side and fresh waterfalls on the slopes of Matheran on the other. We also noticed the small village just below Garbut point. We were still climbing when we risked taking our cameras out and what we got in return was a treasure pic! I have named it “Natural Refrigerator” & I also have recorded a video of it. This photo reminds me of a scene from Jurassic Park 3. What else we saw? We saw the wind blowing all the fog in our direction and the entire area was once again covered in white! At 12:40pm, we were atop the Garbut point of Matheran. All of us had faced some or the other challenge in this trek. Bhavik KPMG wasn’t carrying any Windcheater! Bhavik PWC dared to trek in his chappals! Tejang had recovered from back pain & still carried a heavy rucksack! He also suffered from shoe-sole problem. Thankfully Bhavik PWC’s shoes fit him well. Kudos to everyone! All these reasons gave us a greater sense of satisfaction and happiness. For me, it was a nice feeling to lead and complete the trek successfully! All of a sudden our mannerisms changed from that of a trekker to that of a tourist! In no time, these guys were combing their hair and adjusting their looks! A 2-hour peaceful walk on the typical red-soiled paths surrounded by dense jungle led us to the famous rail tracks of Matheran. This walk was in total contrast to the one we had on the plateau. We proceeded to the market place and entered a restaurant where we had lunch (that too from our own Dabbas!) Thus, we entered Matheran without paying any entry fee! After changing into dry clothes and shopping for the famous plastic hats & raincoat of Matheran, we proceeded to Dasturi naka. On the way we had ‘Garma garam bhutta’. It was 30 minutes past 4pm. Reached Neral station by the taxi from Dasturi. At Neral, we saw an empty train leave for CST in front of our eyes. We knew it’d be futile to board a train from Khopoli or Karjat (as it’d be full and we won’t be guaranteed of a seat) so we first took a train to Karjat and returned home by the same train – with guaranteed seats. This strategy is no more a secret. Its gaining recognition rapidly. But it works still! Terrific work dude!I had an instant flashback of the couple of treks I went on with you, as part of Podar hikers. And more than anything else, the snaps you have uploaded are fantastic!